We are pleased to inform you of an advancement in your neighborhood that is	readily available to everyone. The Downtown Dental Studio is a state-of-the-art dental office that provides care of exceptional quality and a commitment to each patient deserving the best treatment available. Our convenient location in downtown Manhattan allows our patients to take advantage of the flexible office hours and a guarantee of their prompt return to work. The punctual appointment scheduling permits a timely dental visit for a businessperson on their lunch hour. The staff of the Downtown Dental Studio strives to make good on its commitment of a maximum 15-minute wait or the patient's lunch is on us. 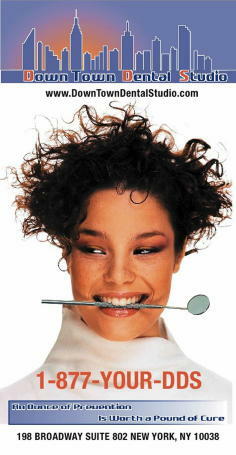 The staff of the Downtown Dental Studio strongly follows the motto of "an unce of prevention is worth a pound of cure". With that in mind, we encourage you to take the time and consider becoming a part of our Dental Studio. We participate with most major insurance carriers, offer corporate discounts and a competitive fee schedule.